Beef brisket is an American barbecue treat and well worth the patience required to cook it on a grill. Whether you use a charcoal or gas grill, the brisket must cook very slowly with indirect heat to become tender and juicy. You may need to fire up the grill during breakfast to cook a full brisket in time for dinner. Don’t be deterred -- there is no match for the smoky, meaty brisket when it’s finally ready to slice and serve. Ask your butcher for a full beef brisket with the fat untrimmed. An outer layer of fat is essential to keeping the meat moist and juicy during the long cooking time. Massage the meat with your favorite dry rub or a generous amount of salt and pepper. 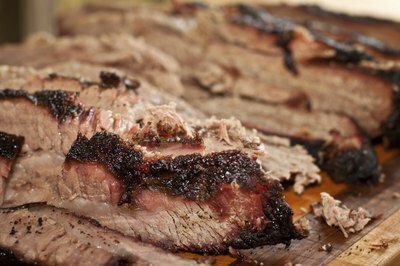 If you have time, wrap the brisket in plastic and refrigerate it overnight so the meat absorbs flavor from the spices. Bring the brisket to room temperature about 45 minutes before cooking time. Meat cooks more evenly if it isn’t cold in the center. For a charcoal grill, fill the chimney with charcoal and stuff the bottom with crumpled newspaper. Light the paper on fire, then let the charcoal burn until it becomes ashy. Dump the hot charcoal on one side of the grill’s bottom grate. For better smoke flavor, add a couple of large chunks of mesquite or hickory to the coals. For a gas grill, soak a couple of handfuls of mesquite or hickory wood chips in water for 30 minutes. Drain the wood chips and place them in a foil tray. Position the tray of wood chips on one side of the bottom rack of the grill, then light only the burners that are directly under the wood chips. Cover the grill until the charcoal or wood chips are smoky but not flaming. If your grill is equipped with a thermometer, it should read about 225 to 250 degrees Fahrenheit. Fill a foil tray with water and place it on the bottom rack of the grill next to the charcoal or the wood chips. The water pan catches drippings and creates steam to keep the meat moist. Position the brisket on the grill’s upper rack above the drip pan. The brisket should be as far from the heat source as possible so that it can cook very slowly. Cook the brisket with the grill covered, adding a few coals every hour if you are using a charcoal grill. Maintain the grill temperature at between 225 and 250 F.
Check the temperature of the brisket after it has cooked for at least an hour per pound. For example, cook an 8-pound brisket for at least eight hours. The brisket is done when a thermometer inserted in the thickest part of the meat reads 190 F and the meat is fork tender. Remove the brisket from the grill and let it rest for about 30 minutes before slicing. The rest period helps the meat retain its juices during slicing. Cut the brisket into thin slices across the grain. Serve the sliced brisket plain or smothered with barbecue sauce. A classic Texas-style dry rub includes brown sugar, paprika, garlic powder, dry mustard, black pepper and cumin. For extra flavor, baste the meat with beer or another marinade after the first few hours of cooking. Never leave a grill unattended while the heat source is activated. Make the brisket on an occasion when you can devote the whole day to keeping an eye on the grill.